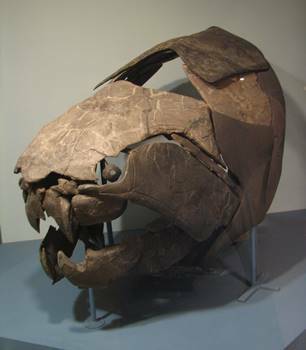 The water was everywhere and it was certainly where most of the action was: while trilobites had been thriving for over a hundred million years and were still common during the Devonian, the rise of many, varied types of fish started, some of which still swim in our oceans today. Sharks and rays began to evolve from earlier fish forms and plenty of other well-known marine animals flourished. Ammonites, brachiopods, and crinoids became widespread, and among the many lobe-finned fish, some evolved into what would eventually become the first true tetrapods–the ancestors of all amphibians, reptiles, mammals, and birds. Husband, father of two boys. Has traveled extensively while working for the last 15 years as a healthcare consultant. University of Michigan/Ann Arbor (B.A.) and Indiana University/Bloomington (M.A.) alum. Love dinosaurs and other prehistoric life, love to visit natural history museums. 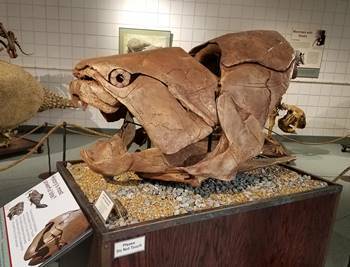 This entry was posted in Ancient Fish, Fossil of the Month, Natural History Museums and tagged Ancient Fish, dinosaur museums, Dunkleosteus, Fossil of the Month, Natural History Museums. Bookmark the permalink.